Erica Synths Black Code Source is unique design true stereo digital noise or dual random CV generator, using a complicated calculation of polynomials of various configurations. 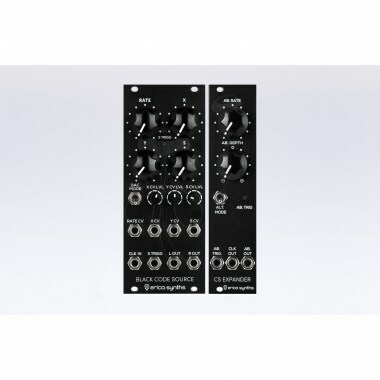 Eurorack модули Erica Synths Black Code Source & Expander bundle Вы можете купить по выгодной цене в наших музыкальных магазинах в Москве и Санкт-Петербурге, интернет-магазин, доставка по России. Erica Synths Black Code Source is unique design true stereo digital noise or dual random CV generator, using a complicated calculation of polynomials of various configurations. Erica Synths Black Code Source Expander takes the Code Source to next level by adding autobend feature and more noise/CV modes.